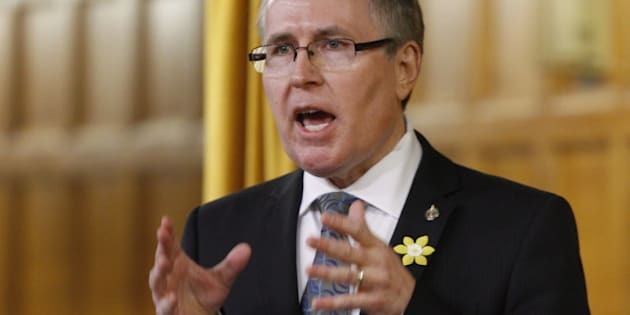 OTTAWA - Whether or not Stephen Woodworth's pro-life motion passes Wednesday in the House of Commons, the Conservative backbencher will have sparked more debate and attention on the abortion issue than any other MP in recent years. Woodworth has also reached a celebrated position in the Canadian anti-abortion community as the MP who was willing to speak out and even defy the prime minister's position. "Thank you! Your voice is being heard across our nation, and we should stand behind you as you present (Motion) 312. We need a law!" one of Woodworth's Twitter fans tweeted Tuesday. Following question period, the MP for Kitchener Centre was once again swarmed by cameras and microphones outside the Commons chamber. "I long for the days when I could walk out of the House after (question period) and not get scrummed," Woodworth said with a smile to reporters. Woodworth's private member's motion would see Parliament appoint a 12-member committee to study the definition of human being. The Criminal Code currently considers a child a human being when it emerges alive from the mother's womb. He said he was still lobbying MPs to support the motion — Immigration Minister Jason Kenney, for one, has said publicly he intends to vote for it. Prime Minister Stephen Harper, on the other had, has said he will vote against it, since his party committed during the last election not to reopen the abortion debate. Other bills and motions that have come before the Commons were more direct — one, for instance, would have added a separate criminal charge when an unborn child is killed or injured in an attack on a pregnant woman. But Woodworth, a lawyer, has insisted that his bill is only about analyzing the issue, bringing in scientific and legal information to determine whether a fetus should be declared a child earlier than at birth. He said it's not about criminalizing abortion. This same issue recently made headlines in the United Kingdom, where a woman was jailed for eight years after taking a drug to abort her fetus at 38 weeks. Natalie Hudson Sonnen, executive director of Life Canada, said Woodworth's approach has educated people about how the unborn are treated in law. "I think it's been particularly effective because of its potential to teach the Canadian public and also that it's not pushing for legislation at this point," said Hudson Sonnen. "It's pushing for something that is very rational, that we have a discussion on this based on the science...and to bring that to bear on this issue." Longtime pro-life advocate Jim Hughes of Campaign Life Coalition said he wouldn't be surprised if Woodworth gets the organization's Joseph P. Borowski award for MPs who defend life and family. It hasn't been awarded in three years. "He's certainly not a wingnut," said Hughes. "He's a passionate individual, his logic is built on his training in law, and he's definitely a man of principle and it's wonderful to see somebody like that stand up for what they believe." Woodworth's motion obviously also has many detractors. NDP MPs Francoise Boivin and Niki Ashton said he never should have been permitted to bring his motion to the floor of the Commons. "There is no room to budge. Canadian women will be watching this vote closely," said Ashton. "We've received tens of thousands of emails and phone calls (from) Canadian women and men who are wanting us to support a woman's right to choose and women's equality and make sure we are moving forward and not backward."